UPDATED: Mon., May 21, 2018, 5 p.m.
Avista’s Washington customers will get smart meters over the next two years, enabling them to track their energy use within a 24-hour period and helping the utility more quickly respond to power outages. The $165 million in new technology will replace a meter system with roots dating to the 1940s. Nationwide, more than 75 million electric meters fit the smart meter profile. 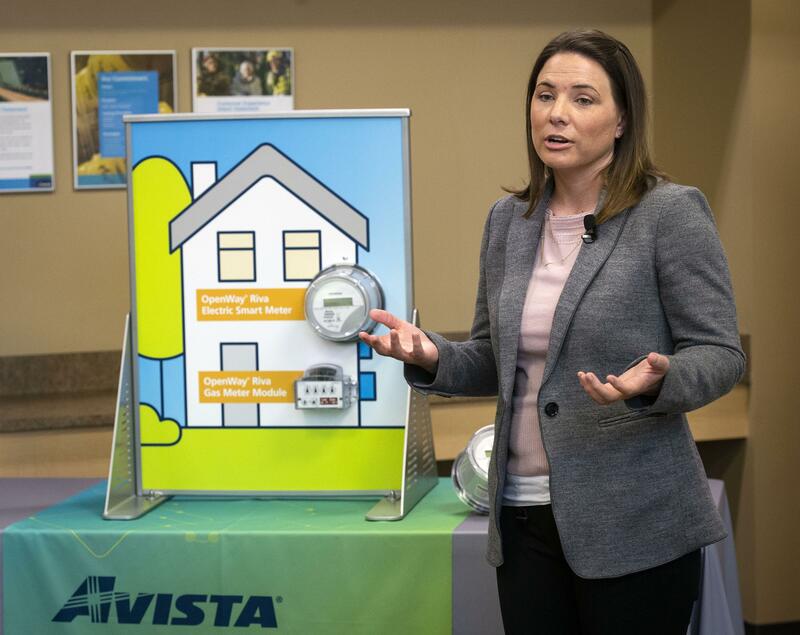 Avista’s customers want and expect more real-time information about their energy use, said Heather Rosentrater, the company’s vice president of energy delivery. With a smart meter system, Avista’s 450,000 Washington electric and gas customers can sign up for alerts if their energy use begins to exceed their average consumption level. Say that college-age students come home for winter break and “crank up the heat,” Rosentrater said. The utility customer will get an automatic alert, along with tips for reducing energy use during the billing cycle. “It keeps people from being surprised by their bill,” she said. Eventually, customers will be able to access information about their energy usage from an app on their phone. In contrast, the current system is kind of like “20 questions,” Rosentrater said. Customers call Avista about a higher-than-expected bill, and a customer service representative takes them through a series of questions to determine what caused the spike in use. Closer tracking of power outages is another benefit of smart meters. If smart meters had been in place during the November 2015 windstorm, Avista estimates that electricity could have been restored sooner to the 180,000 customers affected by outages from the gale-force winds. “We believe it would have reduced the impact by 10 percent,” said Josh DiLuciano, Avista’s director of electrical engineering. The system would have helped Avista pinpoint where outages were occurring and where power had been restored to better deploy its crews. Itron Inc. of Liberty Lake was selected as the contractor for the project. Itron will supply new electric meters for customers and a smart-meter module that hooks onto existing gas meters. The equipment is made at Itron factories in South Carolina and Minnesota. The meters measure the customers’ energy use and send the information to a network router installed on a nearby utility pole. The data is sent to Avista through a secure satellite or cellular signal. No identifiable customer information, such as names or addresses, will be collected or transmitted, Avista officials said. Data about energy use will be encrypted and sent through a secure network through low-power-frequency radio waves. Transmittal times are about three minutes daily, which puts the radio frequency exposure from smart meters at a fraction of other household devices, such as microwaves and cell phones, DiLuciano said. If customers don’t want a smart meter, they can opt out. Those customers will be charged a small monthly fee to have a meter reader continue to track their usage, DiLuciano said. The switch to smart meters means an eventual phase out for Avista’s 47 meter readers in Eastern Washington. After the new meters are installed, energy use will be measured remotely. Avista has spent about four years planning the smart meter rollout. Over that time, about half of the meter readers have retired or taken other jobs at the company, said Laurine Jue, an Avista spokeswoman. Temporary workers are filling those positions, and Avista will continue to work with the remaining meter readers on transition plans, she said. Avista will recover the cost of the new equipment though future utility rates, Rosentrater said. The company’s ability to track its overall energy load with greater precision will save Avista money in the future, and those savings will get passed onto customers, she added. The first 3,800 smart meters will be installed this fall in Airway Heights, Spokane’s University District and the Clear Lake area. After the installation, Avista will monitor how the new meters are working it embarks a major deployment. The installation will continue through the fall of 2020. Published: May 21, 2018, 3:29 p.m. Updated: May 21, 2018, 5 p.m.